These web pages represent a personal perspective on Texas history. They are designed to present the history of our pioneer ancestors who came to Texas in the 19th century. In addition to historical and genealogical information, a bibliography and hyperlinks to related web sites are provided. Two of George T. Crowley, Jr.'s great-great grandfathers, Archibald Franklin Leonard and James Isham Crowley, were Peters colonists. A. F. Leonard and his wife, Mary Ann, brought their three young daughters to this area of Texas in 1845. They were accompanied by Mary Ann's parents, Ambrose and Susanah Medlin Foster, and several other family members. These pioneers from Platte County, Missouri, were part of a group know known as the Missouri Colony. Some of them were charter members of Lonesome Dove Baptist Church. The Traders Oak is one of the trees featured in the book The Famous Trees of Texas published by the Texas Forest Service. Isham Crowley and his family settled on Bear Creek in what is now Northeast Tarrant County. In 1853, Isham and Elizabeth became charter members of Bear Creek Missionary Baptist Church. George T. Crowley, Jr. transcribed the first book of the church minutes (1853-1875). Every effort was made to record the minutes exactly as they were written. He also compiled a database which includes over 400 names of members and other persons who had a connection to the church. Copies of George's manuscript were given to the Southwestern Baptist Theological Seminary, the Fort Worth Public Library Genealogy Department and the Heritage Room of Tarrant County College Northeast. It is hoped that this project will benefit others who are interested in the history of Tarrant County and in the pioneers who first settled here. On motion the church took up the case of building a meeting house and appointed Bros A. Dobkins, B. F. Crowley, T. Rogers a building committee to superintend the building of said house also to procure a bond from Isham Crowley for two acres of land donated to the church by him on Sunday. This cemetery was developed adjacent to the site of the Bear Creek Missionary Baptist Church, which was organized in 1853. The earliest marked grave is that of Hiram Jackson Farris (d. 1858) the infant son of G. W. and Mary Farris. Isham Crowley (1798-1878), who came to Texas as a member of Peters Colony, donated the burial ground and deeded it to church trustees in 1876. The Congregation later moved to Dallas County and was renamed Western Heights Missionary Baptist Church. Still in use, Bear Creek Cemetery is the burial site of many eastern Tarrant County Pioneers. Hiram Crowley was the seventh son of Isham and Elizabeth. Soon after his parents first came to Tarrant County, they became members of Lonesome Dove Baptist Church. In August of 1852, both Hiram and the eldest Leonard daughter, Selete Caroline, were baptized during a protracted Lonesome Dove Baptist Church service. She was twelve years old and he was eighteen. In December 1853, Hiram joined the church at Bear Creek. Selete's parents helped organize Center Springs Baptist Church in 1856. During the same year, Selete's father made arrangements to build a grist mill. Hiram was a partner in the operation of Leonard's Mill. Within two years, Hiram and Selete were married. On May 1, 1858, Hiram was given a letter of dismission from Bear Creek Missionary Baptist Church. He became a member of Center Springs Baptist and served as their Clerk and as delegate to the West Fork Association. Like many young pioneer families, Hiram and Selete worked hard to secure a plot of land and build their life together. Their youngest son later wrote, "Just a few miles North from Fort Worth, runs a small stream that empties into the Trinity River. There is no significance whatever to be attached to this little stream, except that it furnished a suitable site for the location of a ranch and the erection of one of those crude little frontier ranch homes, which at that time were scattered here and there throughout the Western country. It was in the very beginning of the sixties that a young man yet in his twenties and his still younger wife, with a small herd of livestock, which through frugality and watchful care they had been enabled to get together, chose this spot as their home. . . ."
Hiram purchased 160 acres of land from Ephraim M. Daggett in 1857. According to a note written on the back of the deed, a horse and $50 worth of flour were part of the payment. Life was full of promise for this young couple when they were able to move into their small cabin. Their families lived nearby and they all participated in community activities. Selete and her aunt, Dizanna Foster Hallford, were almost the same age. Their relationship was close and their lives followed a similar pattern. Dizanna married Andrew J. Hallford in 1858. Their first son was born a year later. When Selete and Hiram's first child was born, they named her "Dizanna." Their eldest son, Archibald Franklin, was born June 15, 1861. "For a time, all was well, and contentment reigned supreme in that humble home." Then, the burning of Leonard's mill, disrupted their security. When Texas seceded from the Union, many Tarrant County residents were apprehensive about the future. All too soon, the rumors of war became a reality. Several members of the Foster, Leonard, and Crowley families joined Confederate military units. Four of Selete's uncles and A. J. Hallford were among the first to enlist in the Grapevine Mounted Rangers. On January 15, 1862, Hiram enlisted in Company A, 34th Regiment Texas Cavalry, which was also known as Alexander's Regiment. He was appointed Captain of Company A. In October of 1863, a letter from Hiram Crowley, was presented to the Lonesome Dove Baptist Church. Hiram was serving in Louisiana and the men in his unit desired that a chaplain be appointed. Hiram requested that the church allow A. J. Hallford to be ordained to serve in that capacity. It is recorded in the minutes that approval was given "that Bro. Hallford be set forward for full Ministerial labor." He was ordained on October 28, 1863, in the camp near Cheneyville, Louisiana. Selete gave birth to a second son, Hiram Edward, in November of 1863. Six months later, his father was killed in the Battle of Yellow Bayou, Louisiana. 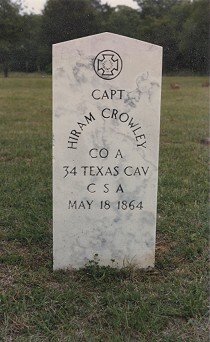 A cenotaph in Bear Creek Cemetery gives the date of Captain Hiram Crowley's death as May 18, 1864. As a widow with two small children to support, Selete displayed courage and strength of character. With assistance from her parents, she managed to maintain the small farm that she and Hiram had worked so hard to obtain. To read more of Selete's story, please click here. The Original Crowley Heritage Page was created on May 10, 1996. ©1996 to present by Pat Crowley.